Plenty of cargo space, outstanding handling, seating for one, and the highest safety record on the market, ZUCA offers a great blend of travel, style and performance. ZUCA's feature the super durable construction of a lightweight aircraft aluminum frame, oversized silent urethane wheels with dynamic flashing LED's for night visiblity and an interchangeable, washable, water-resistant bag in a variety of cool styles and colors. 12 1/2" wide with wheels x 14" x 18". A Best Products Media Guide Choice for Sports, Lifestyle and Leisure. Chose a bag then a frame to match or just order the insert. Wondering if the insert you want is in-stock? Just click the bag or frame you are interested in and we will tell you! If the bag you want is on back order, we'll give you the date we expect to have it in our shop. You can still place an order. We ship to Puerto Rico! Free Parcel Post Shipping to Puerto Rico. 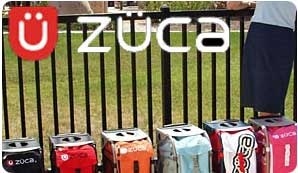 Free shipping when you purchase a Zuca Insert & Frame. New Zuca Inserts have arrived! !